Jamie Kent returns home for his Academy of Music headlining debut! 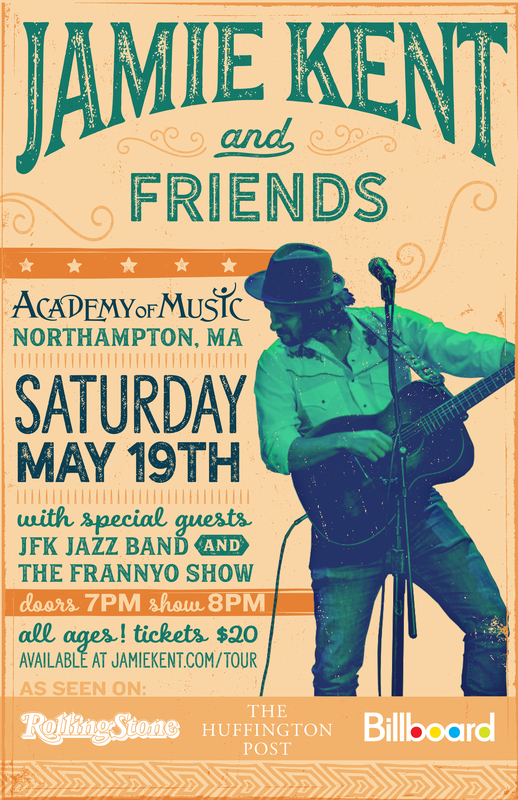 With plenty of surprise guests, and a very special collaboration with the JFK Middle School Jazz Bandin store, this is a show not to be missed! Named by RollingStone.comas an “Artist You Need To Know”, and dubbed a “Must Watch Artist” by The Huffington Post, one might say the future of Jamie Kent looks quite promising. Drawing on influences from modern country rock artists like Jason Isbell and Will Hoge, as well as paying tribute to classic greats like Bob Dylan and Tom Petty, Kent’s perfectly mellifluous tunes are roll the-windows-down, soak-up-some-sun kind of good. Kent has toured with legendary acts like Huey Lewis & The News, The Doobie Bros, America, Foreigner, and Marc Broussard. Kent is supported by The Collective, an amazing grassroots group of fans who help advise and fund his career in exchange for access to exclusive music, merchandise, and vote in the major decisions he makes. He’s officially endorsed by Durango Boots, BOSE, and Telefunken Microphones, and his latest album “All American Mutt”, debuted at #16 on the Billboard Top Country Albums Chart.Landing in between Luke Bryan and Dolly Parton, Kent was the only independent artist to break into the Top 20. With special opener The FrannyO Show!